Okay...........This is the last one for a while. There's only so much stupidity one person should share with his family. I would be concerned that I had tarnished my reputation with these stories of deeds and misdeeds, but I don't have a reputation to be concerned about anyway. Most fellows begin to shed their foolish ways once they leave high school. If not at that time, then surely by the time they leave college or perhaps by the time they reach 30. I've passed all those milestones and yet somehow I continue to do dumb stuff. I'm beginning to think maybe I was adopted. This last story I am confessing to happened during my freshman year at the University of Tennessee in Knoxville. I chose UT partly because Tommy Lovell took a group of us Juniors and Seniors up to Knoxville to see a football game in 1959. We spent the night in Coach Lovell's old Fraternity House on the UT campus after seeing a game. The next day got a tour of the "Hill", as UT - Knoxville was called. Alpha Tau Omega Fraternity members were a quiet, scholarly, demur group of young gentlemen. They frowned on throwing wild parties with loose women; loud music and gyrating dancing was considered beneath them. I was quite impressed with their behavior that evening. Well...........that's what I told my parents anyway. I have remembered all my life an incident that occurred during the "evening's cotillion" when a Fraternity Brother was found walking around with a large rip in one of the back pockets of his slacks. I thought I was being helpful when I pointed out to the fellow that he had a problem and that his billfold was about to fall out. The somewhat inebriated young man slowly looked back at his pants and then said to me in a scholarly voice; "Let me give you some advice; never, never worry about what's behind you!" I don't think I ever figured out if he was simply speaking about physical concerns or if he was offering more sage advice about not letting the past get in the way of one's future. You would not believe how many times I have conjured up the image of that evening's quote. And I have lived my life according to the philosophy of that ATO Seer....... who probably spent 20 to life at Attica. Well, whether it was the weekend glimpse of the social scene or the fact that I had somehow decided to enter an engineering school and UT was the only one in the state, I selected Knoxville as the place to call my home for the next few years. I made the journey east with Bobby Patterson. His dad was our chauffeur. My mother and daddy waved bye to me as we pulled out of the driveway at 114 LeDuke Street. They were obviously glad to be shed of me. 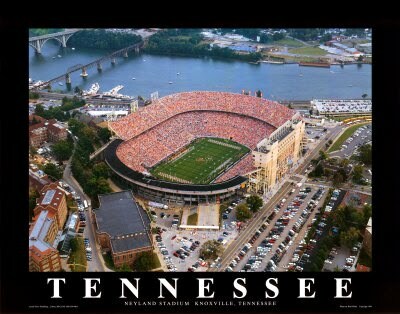 I recall heading off to school with a large trunk and two suit cases and being dropped off at my dorm on the Knoxville campus; Neyland Stadium. That's right, the football stadium. It was built in the shape of a horseshoe and the curved part was a four story dormitory call "The Caves". You could almost get dizzy walking down the circular hallways; and all the rooms were slightly pie shaped. Each room had two small beds, two desks, two chairs, and one closet to share with your roommate. Cinder block walls, one over head light, and a small window made the place look more like a cell-block than a dormitory. But since I was raised in a four foot tall attic with a bathroom tub that you had to roll into, it looked pretty good to me. The walls curved inward, but at least the ceiling did not. Neyland stadium is built on the banks of the Tennessee River and Saturday football games brought scores of boats of all sizes right up to the docks located outside my window. People came to the games by bus, cars, boats and trains. Oh yeah. This story is suppose to be about a Train Trestle. That would be the one that was visible from my dorm room window and can be seen in the picture above. Be patient; I'm getting there. I need to get a hot dog first. 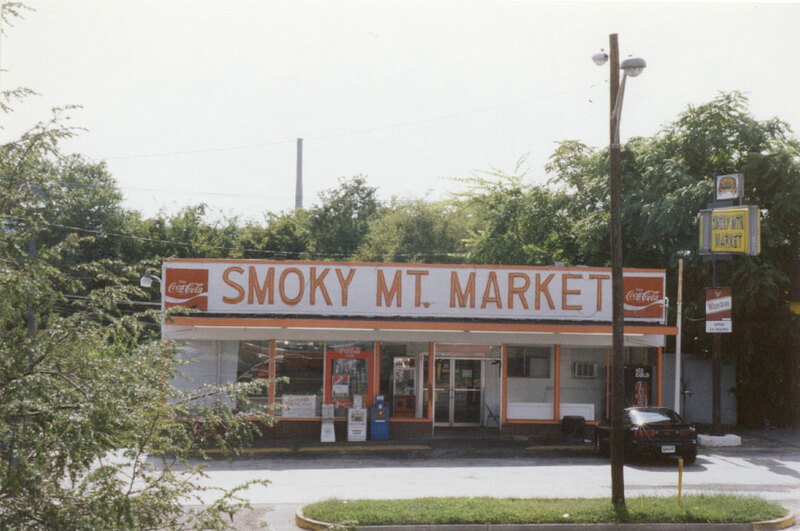 One of the most popular eateries for college kids in Knoxville was the "Smoky Mountain Market" located on Chapman Highway just south of the Henley Street Bridge. The big deal at this tiny little place was the hot dogs. Just mention a Smoky Mountain Market Hot Dog to any Tennessee student of the 60's or 70's and you will see him drool. A Smoky Mountain dog was similar to a Varsity dog familiar to natives here in Atlanta. To get to the Market from the "Caves" you had to walk about 6 or 7 blocks up a steep hill to Chapman Highway, walk another few blocks and cross the Henley Street Bridge over the Tennessee River, and the much anticipated dog would be waiting just ahead on the right side of the road. There was a steady stream of dog starved students making this trip at all hours. 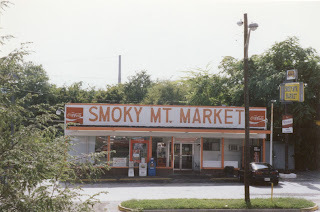 On one particular night 4 freshmen nerds being lead by me made the trip to the Smoky Mountain Market, ate 5 dogs apiece, drank 2 coca-colas each (nerds don't drink beer), and contemplated the long walk back to the dorm. That would be the dorm located at the end of the Southern Railway Bridge which happened to be almost a straight shot across the river from the area behind the Market. 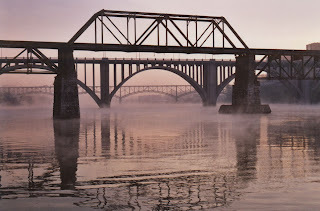 Smoky Mountain Market is near the right end of the bridges. So..................With a combination of lazy, stupid, somewhat adventurous, and stupid (did I say that already) this crew headed from the Market to see what the bridge route looked like. A short walk to the southern end of the trestle revealed that there was no "cat walk" of any kind on either side of the cross ties. And the cross ties were just what one would expect; 10 to 12 inches apart with air between them all the way down to the water. For some reason there were no hand rails connected to the outer ends of the ties. As the picture above shows, until you get to the middle there is nothing to hold on to at all. It took some coaxing to get the two timid members of the group to agree but we decided to give it a try. Off we went and surprisingly found that once you got going and set a cadence and got a little bounce to your step, you could move right along. It wasn't until we were about half way to the middle area of the trestle where the supports were that someone in the group brought up the question about train schedules. No one seemed to remember ever even seeing a train on this bridge although we all had heard train whistles in the middle of the night. As we neared the point of no return our pace had slowed down; partly because we were getting tired and partly because the center structure of the trestle seemed to offer an area of safety if a train did happen to come by. We could just step off the tracks and hold on to the supports. When we reached the end of the center support portion of the bridge even the cockiest of us was really beginning to wonder what was in those coca-colas we drank. Why would anyone in their right mind attempt such moronic foolishness as we were doing. And we weren't home free yet. By this time there were not two, timid, trestle-walkers making this trip; there were four. I suppose its extremely anti-climatic to bring you to the end of this story and have to tell you that no train ever challenged us that evening. 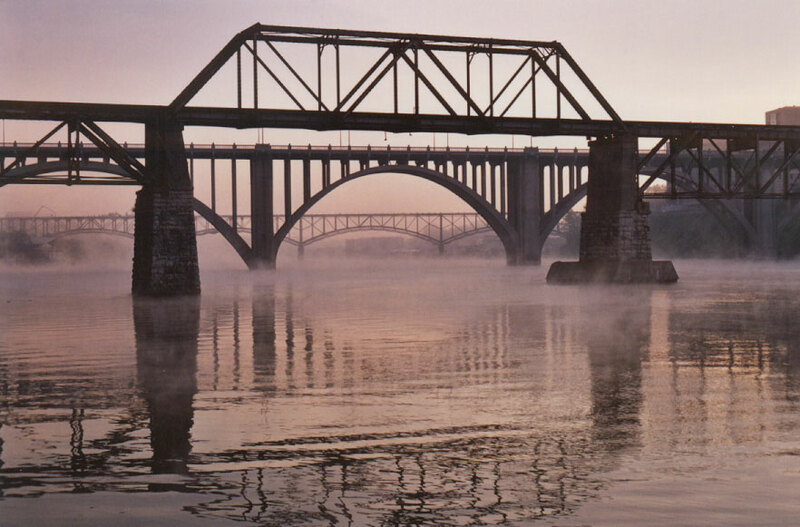 No one slipped and drowned in the Tennessee River that night, and no one really had much "physical" damage at all except for some skinned knuckles when we were all crawling the last 100 yards to the end of the trestle. Emotionally we were a wreck. The bravest of the crew were the original "two" timid members of this foursome. Did I mention that they were also the smartest of our group; both graduated with honors. I barely got out at all. I really don't recall any 0f us bragging about this feat to any of our dorm mates. I truly believe we actually realized that telling anyone what we had done would have dropped us down several notches in esteem as opposed to raising us up. And while I have told this story a time or two, I have previously been very selective. Fortunately no one's really reading these ramblings anyway. Oh, and my Guardian Angel Guy. He put in for a transfer. "But since I was raised in a four foot tall attic with a bathroom tub that you had to roll into, it looked pretty good to me." BEST. LINE. IN. THIS. WHOLE. BLOG. Your angel continued looking out for you giving you daughters. I can't believe you did this stunt. You are crazy! Does Mom know this story? You may not have realized that Dan and Ted went to the UT/Vandy game this weekend (Vandy lost, surprise, surprise). Anyway, Dan said he thought of you during the trip. Thought I'd pass that along...they spent most of their time in bars but as far as I know no train track crossings were involved. The first female I ever saw wearing long pants. "Stupid" started at an early age in my family. She Is a Teacher; "IS" a Teacher. You "CAN" teach an old dog new tricks.